One of our top questions heading into 2016 was whether 2016 would be the year when farm income stopped falling. At the start of the year we weren’t particularly optimistic for a rebound, in large part because livestock prices had fallen considerably from early 2015 levels. In February, the Economic Research Service released their forecast of farm income which projected yet another decline. In this post we will look at the forecast, some of its components, and examine the implications another year of declining farm incomes. The Economic Research Service estimates an aggregate income statement for the U.S. farm sector. Their 2016 forecast is for net farm income to fall an additional 3% from 2015. While this drop sounds rather modest, the decline from the net farm income peak is substantial. 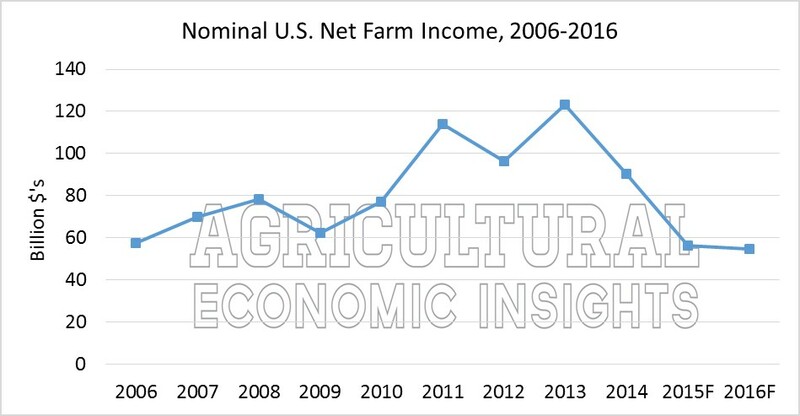 In figure 1 we show nominal net farm income from 2006 to 2016. One can see that in nominal values, net income is back to levels not seen in the last 10 years. The decline from the 2013 peak to today is 55%. A longer-term perspective using real values is shown in Figure 2 which shows how real net farm income has evolved since 1980. In percentage terms, the decline from 2013 to 2016 is a staggering 57%. Of the data shown, the last comparable decline would be 1981 to 1983 when net income fell by 52%. The absolute level of income also shows the magnitude of the decline. Real net farm income in 2016 is forecast at the sixth lowest of the 37 observations shown. The last time income was this low was in 2002. Before that, you must go back to the 1980’s to observe real net farm income at these levels. As ERS points out with this graphic, most of the income declines are due to falling output prices. This combined with sticky costs has led to a dramatic contraction in net income. However, reduced government program payments have also contributed to shrinking net farm incomes. Given the structure of the current farm program and the magnitude to the income decline, farm program payments are expected to increase. Indeed, ERS is forecasting that payments under the ARC and PLC programs will nearly double, increasing from a combined $4.984 billion in 2015 to $9.132 billion in 2016. Although this is a large percentage increase, in real terms, the magnitude of government payments is much smaller than those made in previous farm economic downturns. 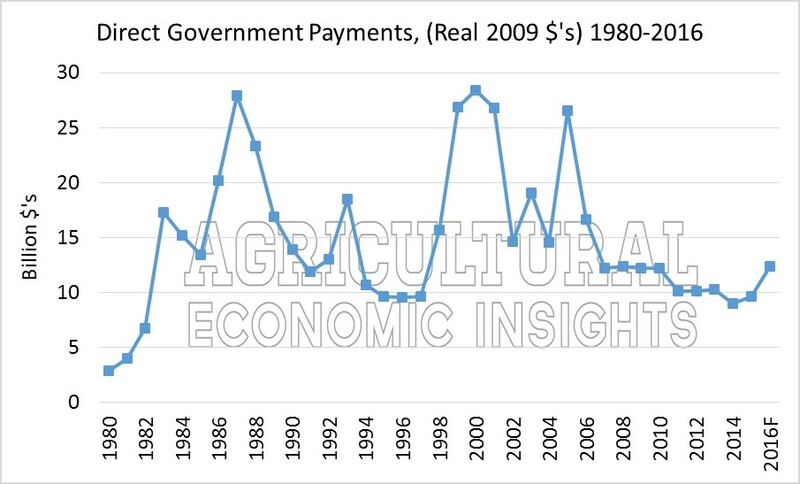 Figure 3 shows the real (2009 $’s) value of direct farm program payments made since 1980. The current real level of direct program payments is on par with that made in the late 2000’s, but less than that made even in the late 1990’s and early 2000’s. Given the structure of the ARC-CO program, one should expect that these payments will start to decline as the guaranteed prices begin to fall. For those interested in the details we described the ARC-CO payment cliff in a 2015 post. The bottom line is that corn and soybeans payments this will likely start to decline when price guarantees start to decline in the 2016 crop year (payments that will be received in 2017) . For example, the price guarantee for corn in 2016 will likely be $4.79 versus $5.29 in the past two years. 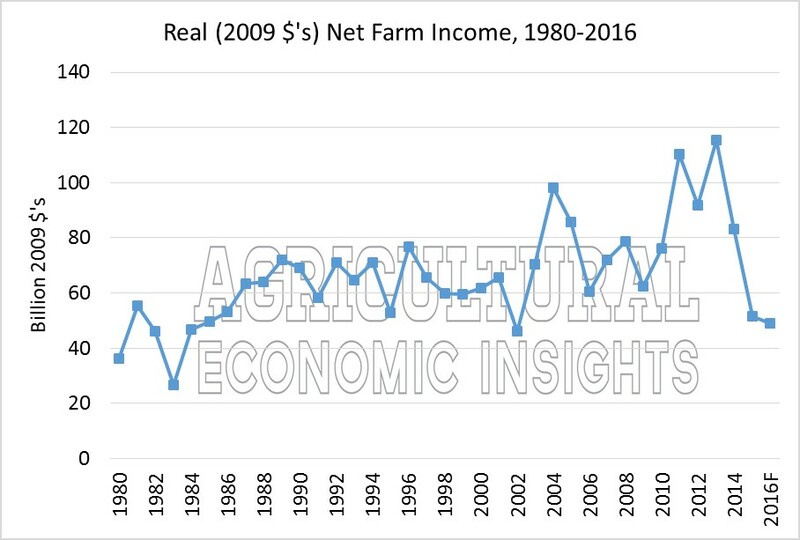 At times it looked as if this could be the year when net farm income stopped sliding lower. However, as the ERS points out, it is now becoming quite likely that yet another year of lower incomes are in store for the farm sector. This will make 2016 the third straight year of declining income. From its peak the decline is as dramatic as anything seen in recent times. Although the current growing season is far from over, soon attention will turn to budgets for 2017. Given the prospect of some very large harvests and the continuing build in grain stockpiles, the income prospects for 2017 are starting to look less than rosy. In this environment the pressure for farmers to continue to cut costs will remain and could very well intensify. This likely means that all variable expenses will again come under substantial scrutiny in 2017. This situation will also likely intensify the downward pressure cash rental rates. It also suggests that spending on capital investments such as machinery and farmland will again contract. To date, credit conditions in the agricultural sector have remained relatively strong. However, as we pointed out in our post about farm sector sentiment, banker attitudes toward repayment rates are as negative as any time in recent history. Additionally as Kansas City Federal Reserve Bank economists have recently pointed out, demands for farm debt are increasing and there are signs that credit conditions are deteriorating. It will be very important to monitor the credit situation going forward as credit conditions can decline rapidly. All in all, the economic situation in the farm sector appears to be continuing to slow. This slowdown has had, and will likely continue to have, many impacts throughout the agricultural sector. The impacts will be felt by everyone from landowners, to farmers, to input suppliers, and so on. While many of these signs have been apparent, it is likely that they will become more so if incomes continue to decline. Agriculture has gone through difficult financial times before. Fortunately, it appears that the sector is financially in better shape to handle this slowdown than in previous downturns. How bad things get will depend on a variety of factors including where commodity prices end up. One thing that is certain is that government program payments will be a welcome addition to the cash flow on many farms this year.